It was a cool day for a walk – I brought home a touch of the flu, a personal souvenir courtesy of my visit Stateside, and today was my first day out again after a self-imposed quarantine. The past week has been rainy, this afternoon was glorious and bright. 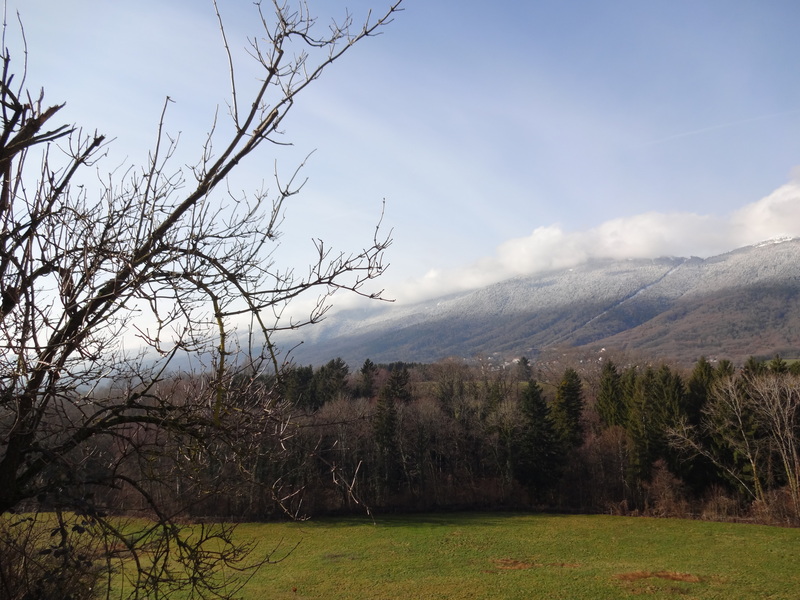 The snow line on the Jura is high for this time of year, around 700 meters (2100 feet), the top of the ridge at 1000 meters was thick with a blanket of fluffy clouds and fog. For the local ski resorts – one of the cableways is visible as the vertical lines on the mountain – this means that there has been some recent snowfall due to the rain, but they are probably supplementing this with snow cannons. And that the ski lift area is socked in with low clouds and low visibility. Not great conditions, although I’m sure the dedicated snowboarders and the parents who want their kids to learn to ski are up there anyway. Local public schools all offer twice-weekly ski lessons throughout winter as a part of the regular school sports program. From age 4 through 10, kids learn to ski. As for me, it was back home and back to bed with a cup of tea.